Totti like's to play tennis and he's favourite music is Pearl Jam and U2. 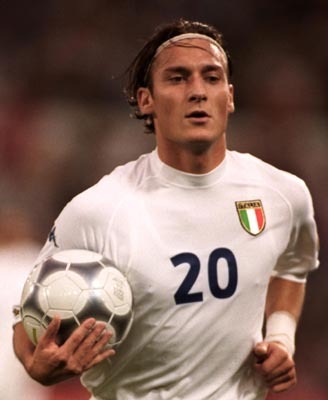 Francesco Totti's position is that of a striker or an attacking midfielder, though he is best known for playing as the trequartista (or second striker), a compromise between the two positions where the player acts as a link between midfield and attack. He is also Roma's first choice to take free kicks, having scored a number of goals from dead-ball situations. Totti is widely recognised as the symbol of Roma, having never left the team despite the possibility of playing in stronger and richer clubs, and being the number one goalscorer and the most capped player in the club's history! Unlike other children his age who preferred to watch cartoons, Totti was always more interested in watching football matches instead. Totti constantly played football with older boys. His mother refused a big deal for her son from A.C Milan while waiting for a deal from his favourite club A.S Roma. His mother intended to never let her son step foot out of the "Eternal City". Totti finally joined the A.S Roma junior team in 1989. Francesco Totti uses a variety of celebrations for special occasions. His most famous celebration was in the Rome derby of the 1998/1999 season. Totti scored the third and final goal for Roma in the final minutes of the game, and celebrated by flashing his undershirt that said, "Vi ho purgato ancora". This translates to, "I've purged you guys once again". This was in reference to the fact that Roma hadn't beaten Lazio in five years before that game. Another memorable celebration was when he took his shirt off and had a shirt under that said "6 (sei) Unica!" meaning you are unique, he flashed this to Ilary Blasi his current wife. His most common celebrations are the one where he runs to the side , kissing his ring finger in honor of his wife and, then pointing upwards with his finger, thanking God. When his son, Christian, was born, he began sucking his thumb as a celebration to dedicate his goals to him. He had a few celebrations that were unique. One time he put the ball under his shirt and he lay on his back as his teammates pulled the ball out. That of course was a skit of childbirth for his newborn son. Another time after he scored in the derby against Lazio he ran to the camera and started filming the crowd. Del Piero & TOTTI in commercial :- ) funny !!!!! The penaly scored by Totti against Australia in the last minute of the game. (World Cup 2006). TOOOOOTTTTTTTIIIIIIIIIII !!!!!!! !